Chapter 14. Next generation lithography—the rise of unconventional methods? As the requirements of the semiconductor industry have become more demanding in terms of resolution and speed it has been necessary to push photoresist materials far beyond the capabilities previously envisioned. Currently there is significant worldwide research effort in to so called Next Generation Lithography techniques such as EUV lithography and multibeam electron beam lithography. These developments in both the industrial and the academic lithography arenas have led to the proliferation of numerous novel approaches to resist chemistry and ingenious extensions of traditional photopolymers. Currently most texts in this area focus on either lithography with perhaps one or two chapters on resists, or on traditional resist materials with relatively little consideration of new approaches. 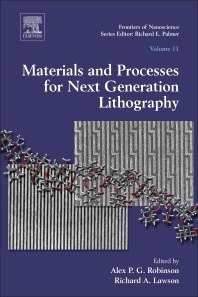 This book therefore aims to bring together the worlds foremost resist development scientists from the various community to produce in one place a definitive description of the many approaches to lithography fabrication. Dr Robinson obtained his PhD in 1999 for work on the development of materials for electron beam lithography performed at the Nanoscale Physics Research Laboratory of the University of Birmingham, and the Joint Research Center for Atom Technology in Japan. Following his PhD he investigated the modification of oxide surfaces using self-assembled monolayer, before returning to the Nanoscale Physics Research Laboratory to continue his research in lithography and microfabrication. He has recently taken up a Senior Research Fellowship in the Science City Research Alliance, based in the School of Chemical Engineering and the School of Chemistry at the Universities of Birmingham and Warwick respectively. He is currently investigating the application of advanced materials within the field of microfabrication, and the integration of functional materials with patterned substrates. Dr Lawson received his B.S. in Chemical Engineering at Tennessee Technological University in 2005. He received a Ph.D. in Chemical & Biomolecular Engineering in 2011 at the Georgia Institute of Technology where he also completed a Postdoctoral Fellowship. Since 2015, he has been at Milliken & Company where he is a Research Engineer working in the area of chemical technologies. He is an author of over 22 publications, 41 conference proceedings, and a U.S. Patent in the area of patterning materials including photoresist and block copolymer design, synthesis, and characterization along with simulation of resist processing and BCP self-assembly.